Before she picked up her trailblazer award, Janelle Monae posed on the pink carpet yesterday(December 6th) for Billboard's 13th Women In Music Event at Pier 36 in New York City. Ditching her signature monochrome black & white looks, Janelle opted for a GARETH PUGH SPRING 2019 grey & white pinstripe jumpsuit. 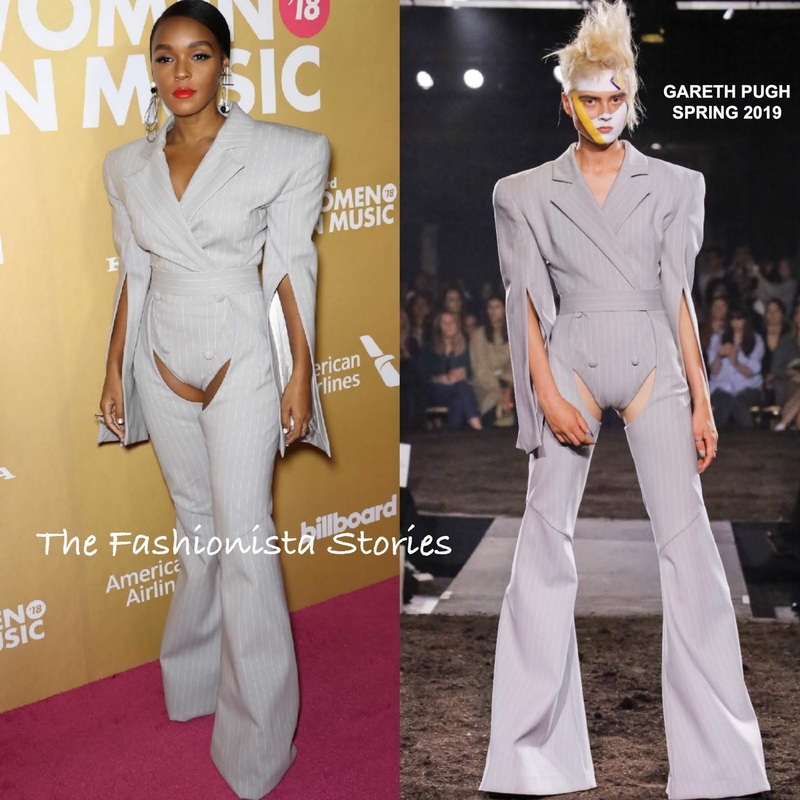 Gareth's designs are rarely seen on the carpet because they are mostly difficult pieces that only people like Janelle, Lady Gaga or Rihanna can probably work. You may remember that Solange Knowles & Teyana Taylor wore pants like this by different designer's. Her pinstripe jumpsuit featured exaggerated padded shoulders, a faux wrap bodice, split sleeves and cutout wide-leg pants. This jumpsuit is a bit over designed and would be better off as a performance piece but I like that Janelle took the risk. Are you feeling Janelle's look?